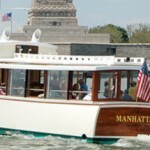 Yachting Around Manhattan: Champagne on a Boat! The mini yachts at the Chelsea Piers Classic Harbor Line hold about 35 people and are reminiscent of an intimate Gatsby party on the Hudson. Champagne is poured into flutes as the Catskill or Beacon yacht circumnavigates the southern tip of Manhattan, and people excitedly take out their cameras when the Statue of Liberty looms nearby. Dusk sets in as a multi-hued panorama. More champagne flows, and soon strings of night lights magically festoon New York City like so many pieces of jewelry. If you’re yachting with, for example, a freckled 10-year old boy, you can also have gingerale, water, and sodas; and for adults who prefer beer to champagne, there’s that option as well. Three drinks are included in the cruise, and you’re encouraged to bring your own snacks on board since no food is served. Pick up tickets at the northern end of Chelsea Piers on the water, and line up early if you have a favorite spot on the boat. You’ll feel grateful to live in the greatest city in the world as you cruise underneath the majestic Brooklyn Bridge in all of its glory at night. This is exactly the type of New York experience you and your loved ones or friends will always remember. 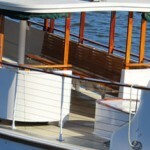 Find more details and photos for cruising aboard these NYC yachts click here! Comments Off on Yachting Around Manhattan: Champagne on a Boat!